There’s nothing better for recovering from a Thanksgiving day weekend turkey and trimmings hangover than a fresh salad. But rather than make you go “cold turkey”, this salad creation was built to satisfy and satiate. Again, no going cold turkey…literally. 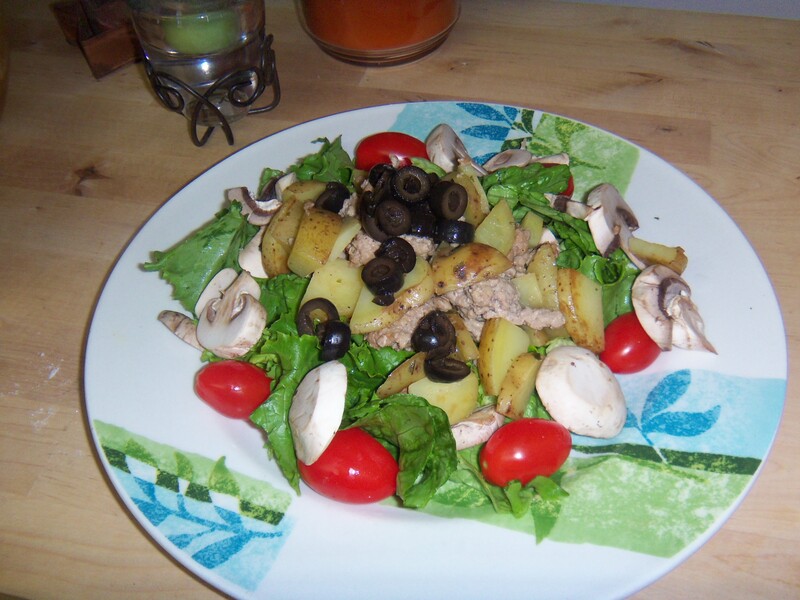 This recipe combines ground turkey, greens, & black olives with the Produce Geek‘s buying recommendations – Yukon gold potatoes, grape tomatoes & white mushrooms. Finished with my Honey Citrus Balsamic Vinegar dressing, it’s tangy, tasty, crispy…and more than hearty enough to give you the energy you’ll need for a demanding day of Cyber Monday shopping. Vegetarians/Vegans: Substitute your favorite beans for the turkey. Gluten-conscious? You’re good to go provided your vinegar is in the clear – read the label! Toss the green leaf and romaine lettuce together and place on plate. Heat a small amount of oil on medium heat in a large deep frying pan or wok. Add ground turkey and chives, and cook until the meat is fully cooked. Remove meat from pan/wok & set aside in a large bowl. Add a little more oil to the pan/wok and cook the potatoes on medium heat until tender. Remove potatoes from pan and combine them with the ground turkey in its bowl. Allow to cool for approximately 10 minutes, and then top each plate of greens with even portions of the ground turkey/potatoes mixture. Arrange the mushrooms and tomatoes around the perimeter of the salad. Top with black olives. In a small bowl, whisk the following together to create the dressing: olive oil, balsamic vinegar, basil, honey, sea salt & pepper. Serve salad with the dressing in a carafe, & dig in! Make as many servings as you need to feed your family and friends! And don’t forget to subscribe to the Produce Geek’s Eat This Now blog to stay in-the-know about what to buy each week. Title catch your attention? Just as I intended! “B.S.” in this case represents something other than what you might have interpreted it to mean. It stands for two key ingredients in this week’s stir-fry: Brussel Sprouts and Butternut Squash. Thank you Produce Geek for choosing produce picks that are not only delicious, but that also allowed me to form a rather clever name for this week’s dish. This vegan stir-fry featuring pinto beans has a lot of substance – and a lot of flavor – thanks to the weekly picks that also include Granny Smith apples, and my peanut sauce. Serve over brown or basmati rice if you wish, but I believe you’ll find it perfectly satisfying on its own. Vegetarian/vegan: Enjoy – this dish is 100% both. Warm 2 tsps peanut oil in an extra large deep frying pan or wok on medium heat. In the meantime, prepare stir-fry sauce: Whisk together remaining peanut oil, peanut butter, apple cider vinegar, liquid aminos, honey, garlic & cayenne pepper in a medium bowl and set aside. When oil in pan is hot, add brussel sprouts & squash. Stir until tender, but not soggy (approximately 15 minutes). 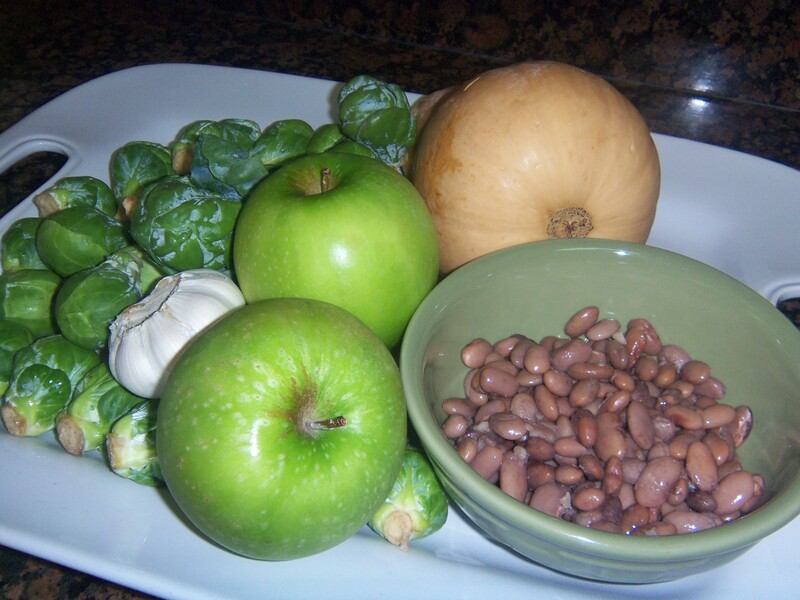 Lower heat to medium-low and add pintos, apples & peanut sauce. Stir until ingredients are warmed and evenly distributed. Serve all by itself (my favorite way to enjoy it) or over rice. When I laid out the ingredients for this week’s recipe, my husband had doubts about the outcome. He wasn’t quite sure how I’d pull off combining butternut squash, russet potatoes, salad greens, hot peppers & chicken into a single dish. How dare he doubt me! This one turned out to be one of his favorite salads – EVER. Heeding the Produce Geek‘s buying recommendations this week, I stir-fried the squash, potatoes, hot peppers, and chicken – and then created a stir-fry atop a salad. Enjoy the warm flavors and crisp greens with my creamy garlic chive dressing. Delish! Vegetarians/Vegans: Substitute your favorite beans for the chicken. Vegans can substitute the dairy-based dressing with one that’s vegan-friendly. Gluten-conscious? You’re good to go provided your choice of mayo and yogurt are in the clear – read the labels to make sure they don’t contain gluten. Heat a small amount of oil on medium in a large deep frying pan or wok. Add chicken and hot peppers; stir-fry until chicken is fully cooked, remove from pan/wok & set aside in a large bowl. Remove from pan/wok and add to the bowl with the chicken and peppers. Stir to distribute all contents evenly. Allow to cool for approximately 15 minutes, and then top each plate of greens with even portions of the mixture. In a small bowl, prepare the dressing; whisk together mayo, yogurt, garlic, chives, sea salt & pepper. Serve salad with ramekins of dressing and dig in! My thanks to the Produce Geek for inspiring me to try something new this week. 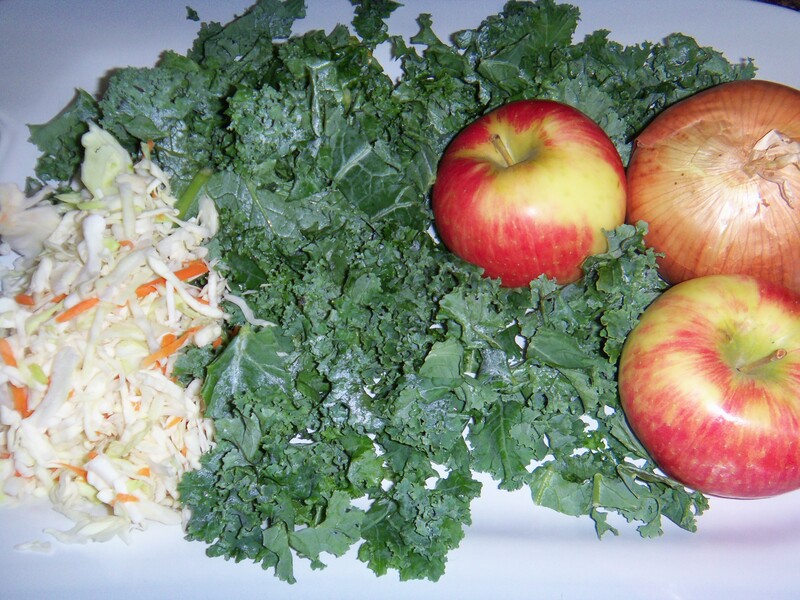 Being the greens lover that I am, I’m almost ashamed to admit that I had never before tried kale in any way, shape or form. Wow! Was I missing out! What I thought would be a bit of a “bitter” experience, turned out to be nothing of the sort. 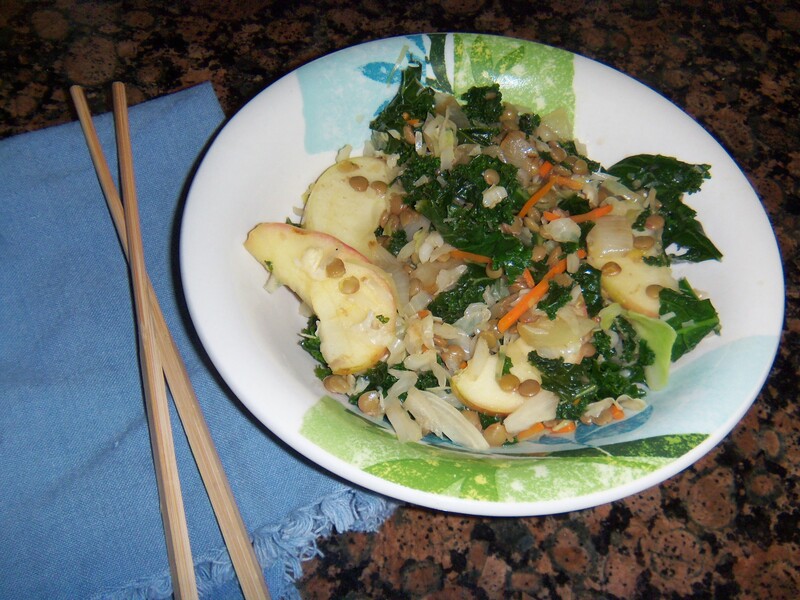 When I combined it into a stir-fry with the Produce Geek’s weekly picks of sweet onions and honeycrisp apples, slaw mix and lentils, it earned my respect – and repeat business. Be prepared to see more if it in future dishes! In the meantime, prepare stir-fry sauce: Combine remaining peanut oil, sesame oil, apple cider vinegar, liquid aminos, honey & pepper in a medium bowl and set aside. When oil in pan is hot, add vegetables and stir until tender, but not soggy (approximately 10 minutes). Lower heat to medium-low and add lentils, apple slices & stir-fry sauce. Serve all by itself (my favorite way to enjoy it) or over brown rice. There’s nothing like a crisp fall day in Pa…nor the flavors of the Produce Geek‘s recommended picks this week. Among them are sweet potatoes and baking apples – two traditional favorites in this neck of the woods. It’s kind of cool that these colorful fall food stand-bys hit their peak just when the leaves are starting to take on their bright and brilliant gold, orange, and reddish hues. Good timing! 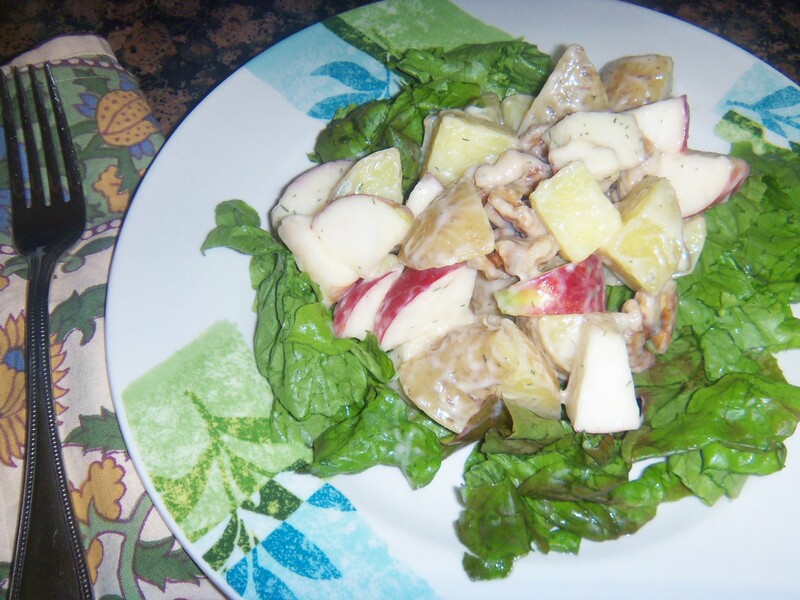 A Waldorf salad with a twist is what my mind (and taste buds) led me to create with the Produce Geek’s suggestions. 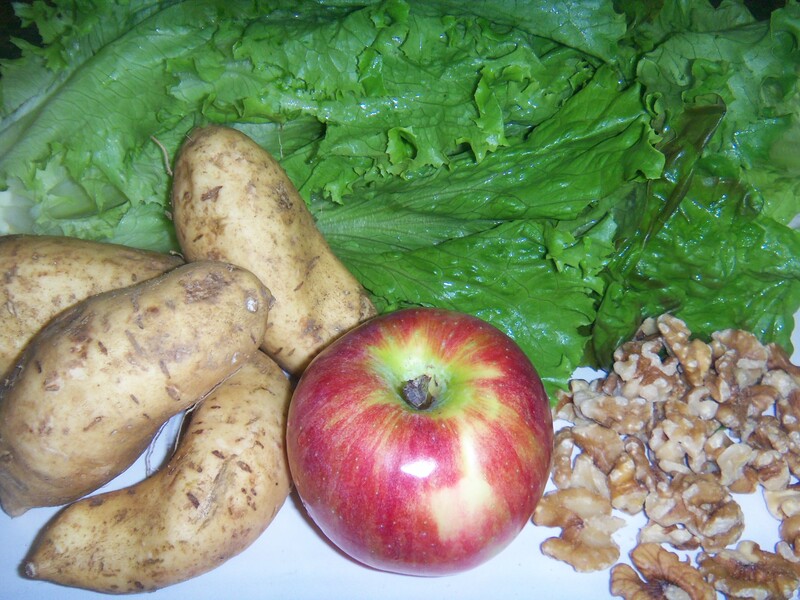 Cortland apples, sweet potatoes, walnuts and healthy greens. Sweet, tart, crunchy, creamy, delicious. My husband pronounced this “a definitive keeper”. I hope you’ll enjoy it as much as we did! Vegetarians/Vegans: No meat here…but there is dairy in the dressing. Vegans can use a dairy-free mayo instead. Gluten-conscious? You’re good to go provided your choice of mayo and vinegar are in the clear – read the labels to make sure they don’t contain gluten. 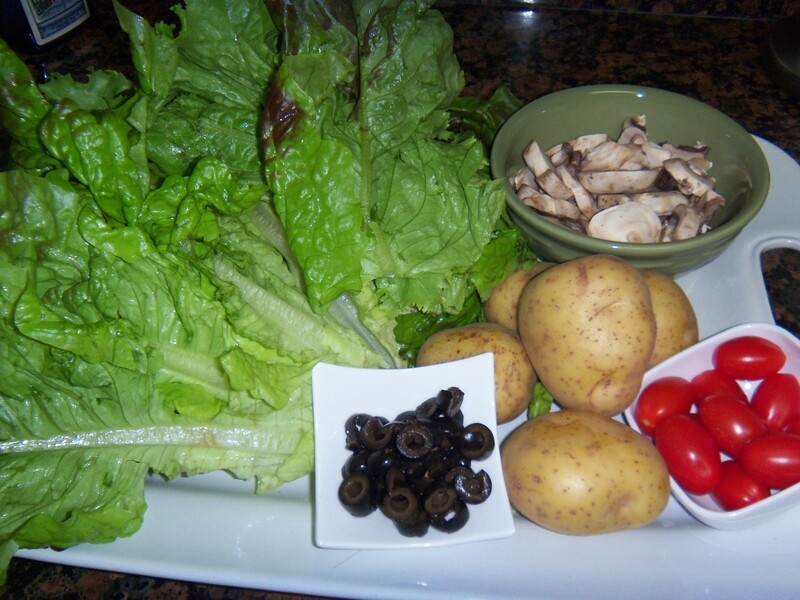 Toss the green leaf and red leaf lettuce together and place on plate. 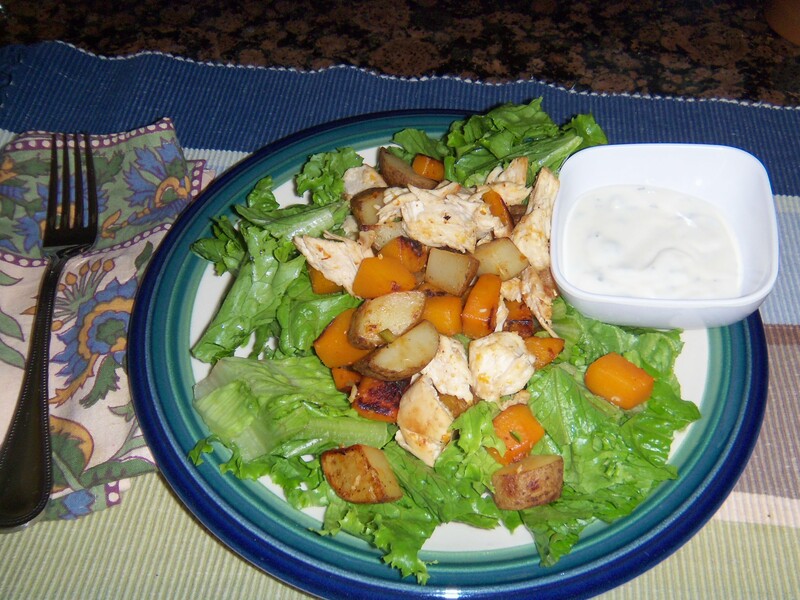 In a small bowl, whisk together mayo, vinegar, dill weed, and honey, then spoon approximately 2 Tbsp of dressing per salad serving to the bowl of sweet potatoes, apples & walnuts. Stir until all ingredients are well-distributed. Place approximately 1 1/2 cups of mixture on top of the greens on each serving plate and dig in! 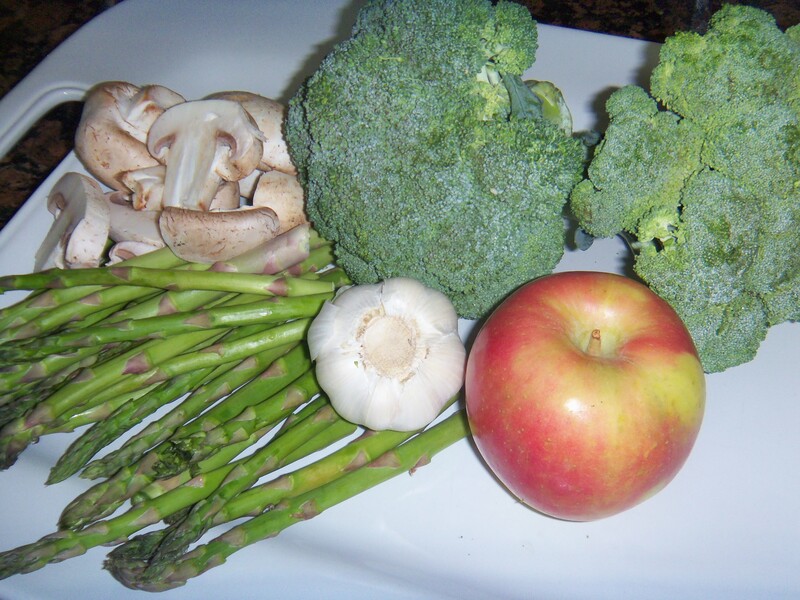 Two of my favorite greens – asparagus and broccoli – made the Produce Geek’s pick list this week. And so did Fuji apples (sweet and firm and at their peak right now!). In just 30 minutes, I combined all three – along with sliced white mushrooms and farm fresh, protein-packed eggs – into a hearty autumn vegetarian stir-fry. Accented by a zingy cider-based sauce, this combo is sure to chase the chill away from those brisk fall days. Vegan version: Substitute the eggs with pintos or kidney beans for your protein-punch. Warm 1 Tbsp Olive oil in an extra large deep frying pan or wok on medium heat. 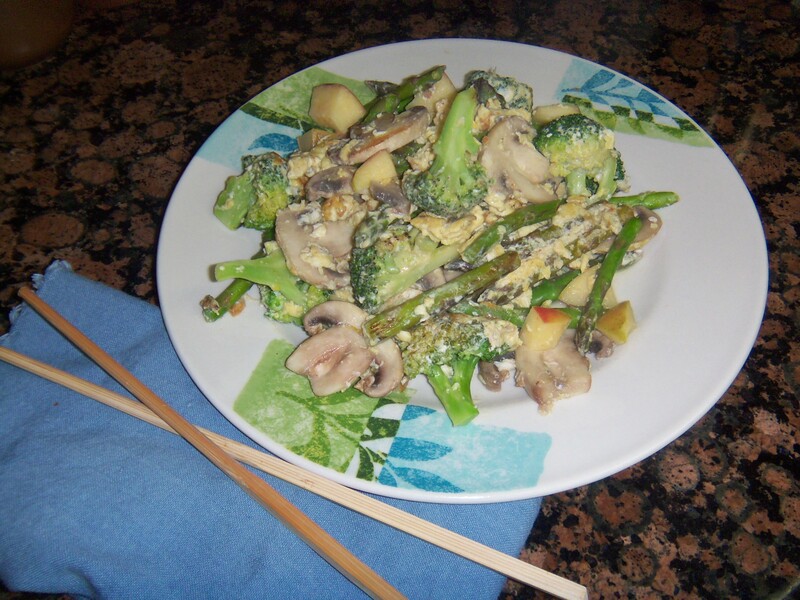 When hot, add broccoli and asparagus. Stir often and cook until slightly tender (approximately 10 minutes). Add mushrooms and stir until they no longer look raw (approximately 3 – 5 minutes). Lower heat to medium-low, add eggs and stir until all are cooked and mixed throughout the vegetables. Prepare the sauce in the meantime – In a small bowl, whisk together olive oil, apple cider vinegar, apple cider, sea salt & cayenne pepper. Pour sauce on top of the stir-fry and stir until evenly distributed. Serve by itself or over brown rice – savor the fall flavors! 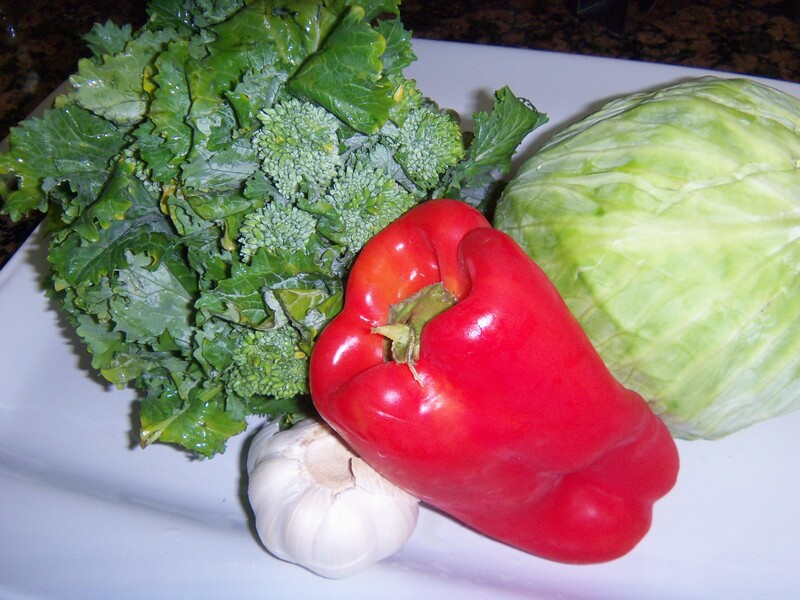 There were some terrific cruciferous veggies on the Produce Geek’s pick list this week. 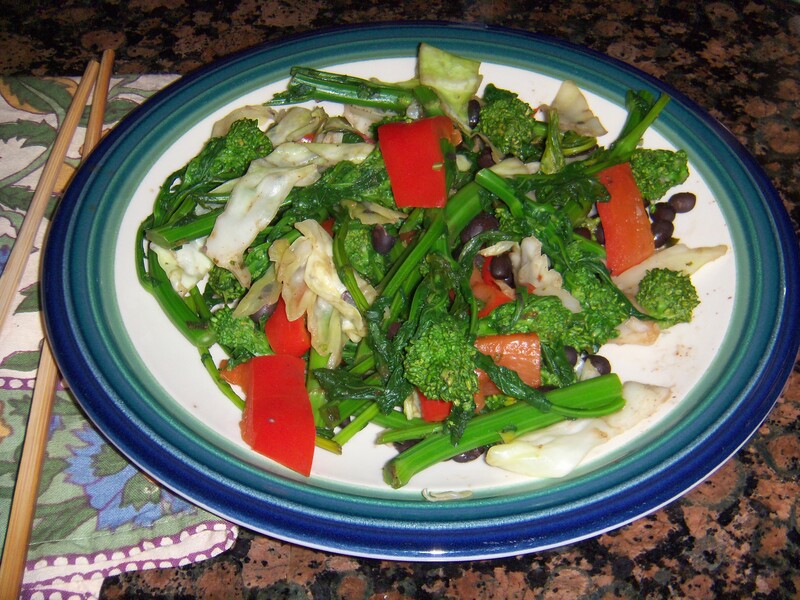 Broccoli rabe and cabbage – both excellent stir-fry raw materials! 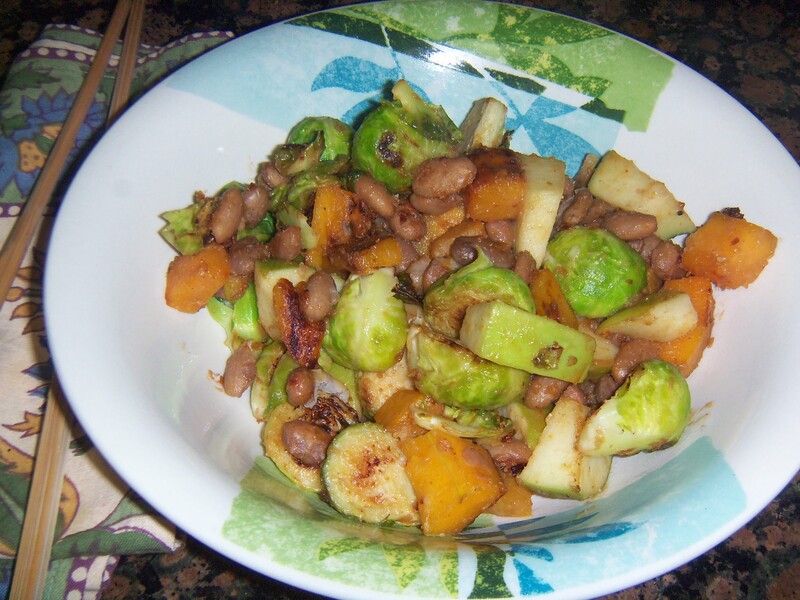 This week, I created a dish that featured black beans in combination with those healthful vegetables. For a splash of color (and to add sweetness to counter the hint of bitterness that accompanies broccoli rabe), I tossed in some sweet red pepper chunks. As for the seasoning, I kept it simple. 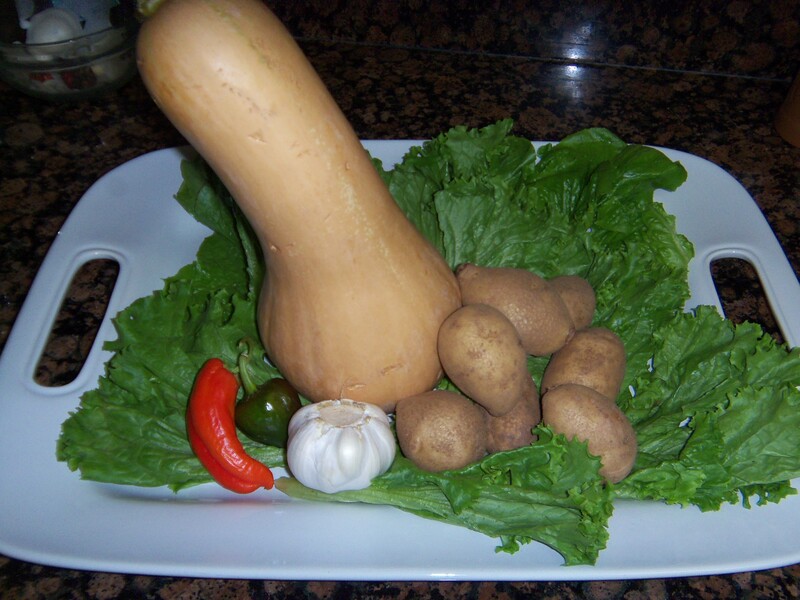 The ingredients bring their own distinctive flavors to the plate and require little enhancement. We ate this one without rice or any other grain, but as always, do as you please to please your own palate! Vegetarian/vegans: This meal is vegetarian and vegan. Gluten Conscious: No gluten here! Warm canola oil and garlic in an extra large deep frying pan or wok on medium heat. When hot, add broccoli rabe, cabbage and red peppers and stir often until tender yet slightly crunchy (approximately 10 minutes). Lower heat to medium low and add black beans, spices and honey. Stirring until all ingredients are distributed evenly.